It is ok to say you want it…. The last couple of years I have really found my confidence and my voice in so many different situations. I have learned that it is ok to go after the things that I want and it is ok to say what you want. I have always thought that it wasn’t ok to say what I wanted and where I wanted to go. But boy has that changed……. I have worked too hard to get to where I am today to sit back and hope things happen for me. And why should I? The answer is I shouldn’t and neither should you. When you stand up and say what you want it does not mean you are pushy or entitled. It means that you have dreams, aspirations and goals and you are not afraid to do what it takes to achieve them. I have been working full time and have made it known where I want to go within the organization and I have been doing everything I can to make that happen. When someone asks me “where do you see yourself in 5 years?” I have the answer ready for them and I tell them with confidence. I am taking a degree that will get me where I want to go and show that I want it and show that I am willing to work for it. And boy am I having to work…. doing a degree and working full time with three kids was probably a bad idea. But it is a good thing I usually just say “Yes” to almost anything. Saying “Yes” is my other way to get to where I want to go; when an opportunity knocks on my door I say “yes”. There are times when I have thought why on earth did I say yes to that, but in the end it has gotten me one step closer to my goal. I know my worth and I know I deserve everything that has happened to me and that does not make me stuck up or a golden child it makes me strong, independent and it says I have goals that I am going to achieve. When we grow up with a disability sometimes we can think that we are not worth what someone who is “normal” is worth. But your disability gives you skills and knowledge that no one else can offer and makes you stand out, and gives your the drive to do what needs to be done. I think it is a bonus that should be used. Am I Getting A New Guide ? Living Without A Guide…. My Guide Dog was forced to retire after being hit by a cyclist. I have been without a guide dog since June 28, 2018 and it has been a challenge for me. I was a cane user for a long time I remember getting my first white cane in High School and hating it and thinking about getting a guide dog and then decided not too. When I lost all of my vision there was no way I could be as independent as I wanted with a white cane, it did not suit my life and how I wanted to live. I made the decision to get a guide dog in 2013 and was matched with my amazing first guide Rick in September 2014. This was a life changing thing for me and I was really able to live the life that I wanted despite doing it totally blind. The last 4 months have been hard I found myself avoiding places because of anxiety and just not feeling confident enough to go alone. I was too proud to ask for someone to go with me so I would just not go, I have worked hard and gained some of my confidence back and have done things that I never thought I would do with a cane and it has not held me back but it has reminded me that there is a part of me missing. I am happy (more like over the moon) and excited to let everyone know that I am getting a new guide dog!! I have been so extremely lucky to have been chosen to be a part of the CNIB Guide Dog program. I will be heading into class in the near future. This time has been a very exciting one but it has also been a time of emotions I was not expecting. When I went to get Rick there was a lot of emotions like fear, anxiousness, happiness, and so many other things. I thought when I went to get my second guide I would not feel those same feelings to the same extent but I have been taken back by all those feelings coming back. I have been feeling scared and overwhelmed with the thought of trusting a new guide dog with my life. I think after the incident that happened with Rick my first guide dog it has actually made that worse because I am terrified to be in that position again. But I also know that there is a part of me missing and that part is a harness in my hand and a guide dog by my side. I have also felt guilty for getting a new guide dog, almost like I am cheating on Rick. I feel guilty for moving on and heading into a class without him. I always knew that Rick was going to have to retire at some point, I never thought it would be so early and I was heart broken. I don’t think there are any words to describe the bond that I had with Rick and still to this day do. I find myself with tears in my eyes just thinking about him, knowing he is not with me anymore. The only saving grace for me is that he is loved by his family just as much as I love him. They handed the leash over to me 4 years ago and I have handed it back to them because they are an amazing family and his forever home. He will always hold a special place in my heart and life. My personal choice is to have a guide dog; that is when I feel like I am the most confident and unstoppable. I love the feeling of flying down the sidewalk with my adorable doggie wagging his tail on a mission to where ever we want to go, no questions asked. I will be documenting my journey and how it all plays out, stay tuned for an update on my new guide dog and my training process. As well as the name and picture of the amazing guide I will be matched with. I have been testing AIRA which is a company that will provide sighted assistance through their app as well as glasses with a camera. The people who are answering the calls from people who are blind or partially sighted have gotten a great deal of training and are able to describe what is around you and answer questions, as well as help you navigate to a destination describing things that you are passing and giving you information that you are looking for. I am just using the app right now and have had a chance now to test it in a few different scenarios in my home as well as out an about in my neighbourhood, as well as travelling for work. My first time using AIRA it was great I was able to talk to the agent and go through the set up and she gave me a really good overview of what they could do for me and demonstrated how I was going to need to use my phone with the app to get the most out of the service. Now I have been able to test it out with calling and getting the cooking instructions on food items as well as reading recipes in a recipe book. I have also called and asked for help with the colour of clothing and different things in my home while doing laundry and trying to sort the kids clothes. They were able to answer all my questions and they described things beautifully. When I asked them what colour something was they gave me an answer like a dark purple where as when I ask my husband he says something like “I dunno it is kind of purplish I think”. They were also great at describing patterns. This has been so helpful in not having to ask my kids or FaceTime my husband. But what I really like about it is that I can ask what I need to know. With some of the other services out there it will tell you purple shirt but maybe I want to know the size of that item of the fabric or maybe the washing instructions and these are things that they are able to help with. One of the things that I tried with the app was going to the grocery store, I needed a few things and wanted to see how they would be able to navigate me around a super market that they themselves had never actually been in. And we all know that grocery stores are all very different and forever changing. What I found out was that they did a great job of helping me to navigate around the store and we found the items that I was looking for, and then the cash register. It was nice not to have to find someone in the store to help me, no one else knew what I was doing so I was just another shopper getting a few things before heading home after work. It felt amazing. The one downside to using the app the way I have been especially when grocery shopping is that you have to be holding the phone at your chest and then you have a cane or guide dog in the other hand so holding the things you are looking for can be a balancing act. ( I will be testing the glasses they just arrived (very excited) so keep an eye out for that). Navigating a unfamiliar city when travelling for work can be a little daunting and after a long day sometimes you don’t have the mental energy to deal with it. I was able to use the app in a city I was in for work and it was great. I found a place online that was close to the hotel and they navigated me there with zero problems and then asked if I wanted them to read me the menu or look up any specials. There was not frustration or searching involved it was amazing. Here is the video of that exact situation that I just described. Aira Video. So far my experience with the AIRA app has been great, I am happy to finally have the glasses as that is the one disappointing thing. It did take two months to actually get the glasses. Now that they are here though I will be doing much more testing. One of my favorite things to do is read, it is a time when I can escape into a whole new world and just relax. I have been known to get a little too caught up in a book and neglecting things like sleep when a book I am reading gets really good. This can be easily done especially when you are blind and do not need lights to read ever. When I was a teenager I loved to read and used to give myself headaches and make my eyes throb with pain from trying to read print and then I just gave up. I started reading braille more and listening to books on C.D and this was a life saver. It allowed me to consume all the books I wanted with out the pain and frustration of trying to see them. And when I say print books I am talking large print books I have never been able to read a regular print book. I do sometimes wish I could read regular print books they are so portable, although this could be very dangerous. I have read some amazing books over the years and I have also read some not so great books over the years. This year I set a goal on my GoodReads page to read 35 books, I wanted to make sure it was something attainable as I do work full time, have three kids, volunteer and I am taking classes as well. So as of August 1,2018 I have read 34 books, and still have 5 months to go. There are two books that have really stuck out for me this year. They were books that just really stuck with me and that I lost lots of sleep trying to cram in as much reading as possible while I could. I don’t only read one kind of book or one genre, I love to try new things. Reading a large variety of genres and types of books it keeps things interesting. Just like the way that I access books keeps it interesting. Lately the number 1 way that I access books is through audio. I use Audible as well as Book Share which is a service for people who are print disabled. Being blind that makes me fall in the print disabled category because I can not access traditional print. But I also like to use iTunes to find audio books. Not all books are available in audio format. I will also use Kindle, kobo, and e-books on iTunes as well as from the library through their app. This way can be a little more frustrating to read as I have to use my screen reader and it can be hard to listen to a whole book like that sometimes, or I use my braille display to read them as well which works pretty well. I love a physical book and when I am needing to be able to sit down and have some quiet time and read and not have something talking to me I love to use Braille. I get braille books from a service called CELA. They mail me one book every two weeks right now and it is nice to go to the mail box and find a new book to read. Both of my favorite books of the year so far have been in audio format and the narrators were really good. That is ne consideration when picking a audio book. You have to listen to the sample so that you know if you like the narrator, if you can not stand to listen to the person reading the story, no matter how good the book is you will not enjoy it. My number 1 book of this year was A Little Life by Hanya Yanagihara this book really made you think and it was an amazing read. The beginning was a little slow but when I got a little ways in I am so glad I kept reading. It was one of those books that I could barely put down. This books is about 4 classmates who move to New York and try to make it work and it isn’t easy, there are pasts that will haunt them and get in the way of their success and it is a book that makes you want to turn the pages faster and faster. My number 2 is The Butterfly Project by Emma Scott this book is about two people with pasts that are less than ideal and they find each other out of survival and end up being more alike than they could imagine. They find out that they need each other more than they would like to admit and it is a great story of sacrifice and triumph and overcoming the odds. I flew through this book staying up way too late just to finish it. And then when it was over wanting it to not be done. What are your favorite books or must read authors? That faithful day when I took my daughter to go shopping after a big move to the city, and we decided to go for a treat at Starbucks. Little did we know that your impatience was going to cost us so much. I am blind and have a guide dog, Rick was his name. He was amazing, sensitive, and great at what he did. He kept me safe and made it possible to move my family to the city, maintain my employment and feel confident enough to take my daughter to the mall and feel like I was being the parent and keeping her safe. You see when someone is blind they are capable of anything but in order to do that there are tools that we need in place to be successful. My guide dog was that for me. He turned my world around, opened doors that I never thought possible, and gave me the ability to live the most independent life I had ever wanted. As I rounded the corner and said “Starbucks”, Rick confidently started on our path to our favourite coffee place. My daughter and I were chatting about what she was going to get and the great purchases we had just made. Then in an instant my world came crashing down………. A man on a bike came behind Rick I didn’t know he was there and all of a sudden Rick jumped and yelped. He had been hit in the side as you tried to go between my guide dog and wall on the sidewalk, then as my dog tried to get me and him out of the way you ran over his front paw. “Sorry” is all you said as you kept on going. My guide dog Rick would not work after this, I called a friend to come and pick me and my daughter up and go get Rick checked out. Over the next 2 months I worked for hours with Rick trying to get his confidence back, wanting so badly for us to be able to work through this tragedy. The school he is from came out from California twice to help me work with Rick. On Tuesday June 26th I hung up my amazing guides harness for the very last time. He left to head back to California on Thursday June 28th. My children and husband and were crying he was like family, he was more than a pet to even them. My world was torn down, as those four paws walked out of my front door for the last time, i felt like I could not breathe. My independence went out the door with him. I have not had to rely on a white cane alone since I lost all my vision completely. I had Rick by my side making sure that we were going to get where we wanted to go safely. He made me feel like the world was not that scary when you couldn’t see it. Now I am trying to gain that same confidence with my white cane. But the truth is, I need to rely more on my children and husband to help me out. It is harder to do things like go shopping, take the bus, get to work, travel for work, and just live my life the way I want to. It is harder because Rick is no longer by my side because you couldn’t wait 5 minutes for us to be out of your way. The reality is that, service dogs are not just dogs they are a life line for so many. The chances of them having to retire if they have an accident, are attacked by another dog, or have a close call with traffic is likely. No one wants to talk about it but it is true, I am living it right now. Give service dogs their space, don’t take away someone’s independence for your impatience. A lost woman and her retired guide dog. 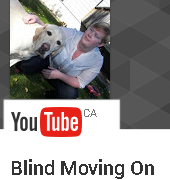 Welcome back to Blind Moving On! I have been on a journey over probably the last year and a half of a more sustainable and natural life. I have found that I want to do more to help our planet and just to live more simply and sustainable. This has been a process and we are nowhere near being close but we have made some changes in our home and are taking steps in the right direction. We first started by pairing down our belongings to live more minimally, and more simply. I feel lighter when we have less stuff in our lives and it has been a process but we are doing really well in this area for our family. The first swap I wanted to make was an easy one and that was with our cleaning supplies. I have asthma and have always had a hard time cleaning bathrooms because of the smell of the products. It was so strong and I could not handle the smell it made it so I could not breathe and I hated it. So I started trying out some natural products, even just plain vinegar, and water. I have found that my favorite products so far are the method products. I purchase mine from Well.ca and I really like the subtle scent of them as well as they do a really good job of cleaning our messes. The next things I wanted to tackle was my beauty products. The first thing I changed in this aspect was my razor. I went to a safety razor, it is all metal and the only waste is the blade which is recyclable. It will last for years and years and save so much plastic from going to the landfill. I have also switched out toothbrushes to bamboo toothbrushes, we are using the Brush Naked brand and I purchased those from Well.ca also. As for products that I use I have been loving this natural vegan shampoo and conditioner by the brand Beauty and Planet. It smells amazing and has done great things for my hair. I have also switched my deodorant to one that is more natural and it is by the brand Beyond Naturals and it is a local small company that I have fallen in love with. The lotion that I have switched to and has been working so well for me is the Everyone Lotion 3 in 1. It can be used on your hands, body, and face and I use it for all of that and it works great. I have eczema and I find it works great even for that. My makeup is going to take a while because I want to use up the stuff that I have now and slowly transition. I purchased a new lipstick and powder foundation from Burts Bees and have been really liking them so far. I am really looking forward to moving to more sustainable natural makeup products as I use up my old stuff. This has definitely been a process for me and my family but I am loving the journey and am feeling great about some of the choices that we have made. I am also excited to keep going on this journey and to do our part. I am a pretty confident blind person when it comes to getting around and traveling. There are so many times that people say to me, you are just so brave and are not scared I just can’t seem to get there. And they feel like they are failing, that they will never be independent because of it. So today let’s be real for a minute. I am scared, I am terrified, I am anxious as all heck, I doubt myself, I doubt my abilities. These are all very real things in my world. It can be scary to stand at an intersection with all of the noises around you and trust that you are going to get yourself to the other side safely. There are many times where I doubt myself and stand there for two cycles of the light so that I can work up the courage to go. When I go somewhere new for the first time in the same city, or a whole new city. I feel anxious and my brain gets pretty creative with what may happen on that journey. I plan it out, I talk my self through the process. Fear is real and fear is ok. It is how we push ourselves to do the things that we feel like we can’t do. I feel like there is no one sighted or not who doesn’t have some sort of fear, anxiety, and self-doubt at some point or heck many points along the way. Fear is what can drive us to work through it and prove to no one but ourselves that we can do it. You are not alone in fear and you are not alone in doubting that you will get to where you want to go, but you are supported to get there and you will get there. Believing that you will get there and telling your fear to “watch me” will get you to where you want to go. Whether that is crossing that busy intersection, riding the bus, moving out on your own, going for that new job or promotion, or just living the life you want to live; use all those feelings to propel you to where you want to be. YouTube video of me crossing a street and having a little chat with you and my dog Rick .